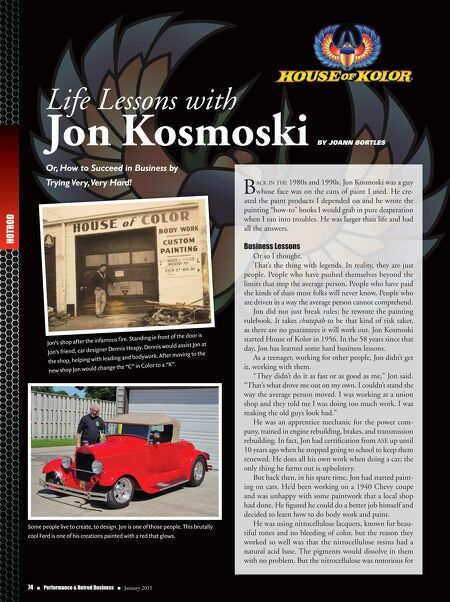 74 n Performance & Hotrod Business n January 2015 HOTROD Life Lessons with Jon Kosmoski Or, How to Succeed in Business by Trying Very, Very Hard! By JoAnn Bortles B ack in the 1980s and 1990s, Jon Kosmoski was a guy whose face was on the cans of paint I used. He cre- ated the paint products I depended on and he wrote the painting "how-to" books I would grab in pure desperation when I ran into troubles. He was larger than life and had all the answers. Business Lessons Or so I thought. That's the thing with legends. In reality, they are just people. People who have pushed themselves beyond the limits that stop the average person. People who have paid the kinds of dues most folks will never know. People who are driven in a way the average person cannot comprehend. Jon did not just break rules; he rewrote the painting rulebook. It takes chutzpah to be that kind of risk taker, as there are no guarantees it will work out. Jon Kosmoski started House of Kolor in 1956. In the 58 years since that day, Jon has learned some hard business lessons. As a teenager, working for other people, Jon didn't get it, working with them. "They didn't do it as fast or as good as me," Jon said. "That's what drove me out on my own. I couldn't stand the way the average person moved. I was working at a union shop and they told me I was doing too much work. I was making the old guys look bad." 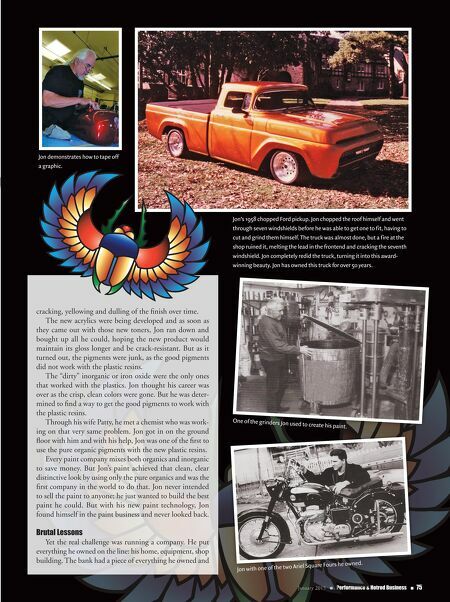 He was an apprentice mechanic for the power com- pany, trained in engine rebuilding, brakes, and transmission rebuilding. In fact, Jon had certification from ASE up until 10 years ago when he stopped going to school to keep them renewed. He does all his own work when doing a car; the only thing he farms out is upholstery. But back then, in his spare time, Jon had started paint- ing on cars. He'd been working on a 1940 Chevy coupe and was unhappy with some paintwork that a local shop had done. He figured he could do a better job himself and decided to learn how to do body work and paint. He was using nitrocellulose lacquers, known for beau- tiful tones and no bleeding of color, but the reason they worked so well was that the nitrocellulose resins had a natural acid base. The pigments would dissolve in them with no problem. But the nitrocellulose was notorious for Jon's shop after the infamous fire. Standing in front of the door is Jon's friend, car designer Dennis Heapy. Dennis would assist Jon at the shop, helping with leading and bodywork. After moving to the new shop Jon would change the "C" in Color to a "K". Some people live to create, to design. Jon is one of those people. This brutally cool Ford is one of his creations painted with a red that glows.